Local investors are starting to see value in Vale SA (VALE.N) shares after a fatal accident last month wiped out nearly a quarter of its market value, while global investors remain skeptical, according to UBS Group AG. Approximately 80 per cent of Brazilian investors are showing interest in buying Vale after the rout, while 70 per cent of global investors are holding back, UBS analysts Andreas Bokkenheuser, Marcio Farid and Cleve Rueckert wrote in a report dated Feb. 8, mentioning recent conversations with 30 investors. Reluctant foreigners have cited the risk of dividend funds pulling out of Vale after it suspended payments, more credit downgrades, and general concerns about negative news flow. 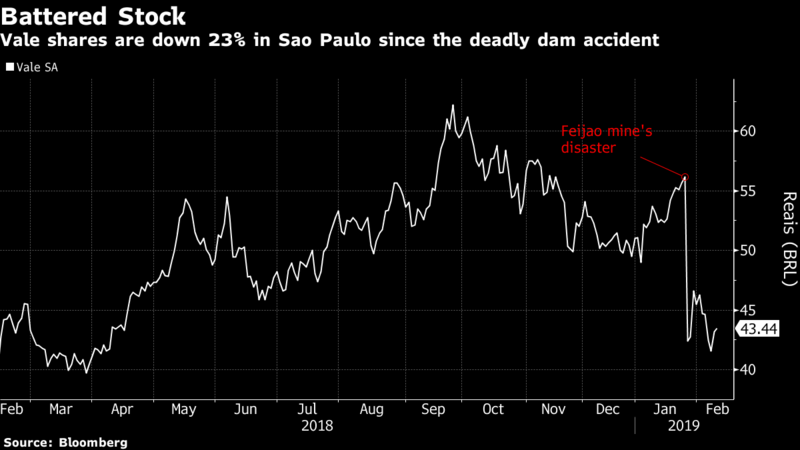 An operating license was revoked for its Brucutu mine in the aftermath of the dam rupture at the Feijao mine that has resulted in at least 165 deaths. The increased scrutiny has added to concerns about how long it will take Vale to resume normal operations. The diverging views on Vale echo a wider investor approach to Brazil’s stock market. Locals fueled a rally that has taken the Ibovespa index to record highs this year, while foreigners pulled more than 11 billion reais (US$3 billion) from Brazilian stocks last year as they wait for concrete signs of progress on fiscal austerity. UBS reiterated its neutral rating for the stock, while cutting its price target for Vale’s American depositary receipts to US$12 from US$15. It cited recent production disruptions and potentially higher replacement costs, which are partly offset by higher iron ore prices. “The lack of clarity pertaining to production and licenses from here supports a neutral rating,” the UBS analysts said.